Although its 1280 x 800 pixel resolution stretches seriously thin on such a large display, at least it's an IPS LCD unit that offers great viewing angles. Otherwise, the quad-core 1.2GHz processor of the Tablet 10 has little trouble pumping out all the pixels to the screen and it feels snappy (though probably not lightning fast). There's also the trademark built-in 3-stage kickstand, a 9,000mAh battery and dual front stereo speakers with Dolby Digital Plus for multimedia viewing. Lenovo recently announced their Lenovo Yoga Tablet 10+, which brings up the resolution to 1920x1200 pixels and has a better processor, but it's yet to be released. The Archos 97b Platinum HD again makes our list thanks to its a very respectable 2048 x 1536px screen, which is the same diagonal and aspect ratio of the new Apple iPad Air. It also has a premium all-metal back, alongside a quad-core processor. Then, there are the German only brands Odys (their Odys Iron tablet), Captiva (their Captiva Pad 9.7 Super FHD and Captiva Pad 10.1 Quad FHD tablets), Xoro and Blaupunkt (their Endeavour 1010 tablet). There is also the Chinese Onda V972 tablet, which is an identical twin of the Blaupunkt Endeavour 1010. These have pretty close specs to the Archos tablet with slightly different external design. Unfortunately, none of these tablet makers (or rather sellers) can be considered major per se, so getting into details about those would be crossing a line we promised we wouldn't cross for this tablet. Asus makes it onto our list thanks to its affordable yet capable Memo Pad FHD10 tablet. At 1920 x 1200 pixels, the 10-inch IPS LCD display provides great sharpness and wide viewing angles. Besides white for the back panel, the Asus Memo Pad FHD10 also comes in some interesting color options like Royal Blue and Vivid Pink. Google's Nexus 10 offering by Samsung is now almost two-year old, but has aged well thanks to its dual-core 1.7GHz Exynos 5250 chipset and excellent 2560 x 1600 pixel Super PLS TFT display. The resulting pixel density is just under 300 ppi. That and the 1080p video recording, Android 4.4 KitKat, and ample 9,000 mAh battery make it a very compelling value at a price that continues to fall. However, there is no microSD card slot, so we recommend you go for the 32GB version. The 32GB version will run you about the same price as the Memo Pad FHD10 with a 32GB memory card, so choosing either of them is really about choosing your priorities: more than 32GB storage vs. a higher-res screen, or a bigger battery and timely Android updates. Rumor is Google will finally present the successor of the Nexus 10 this summer. Sony's Xperia Tablet Z is one of the most stylish tablet offerings you'll see at this or any other size, with is dual-glass panel design and ultra-slim 6.9mm waistline. Under the hood there's a 1.5GHz Snapdragon processor with 2GB of RAM and Adreno 320 GPU, and its Android 4.4 KitKat update is already seeding as we speak. The relatively small 6,000mAh battery is the only real downside, as you may not get much time between charges, but battery life is still passable. Thanks to the launch of its successor, the Xperia Z2 Tablet, the Tablet Z has dropped in price considerably and is now worthy of your consideration as it costs about the same as the Nexus 10 mentioned above. Rather uncharacteristically, the Apple iPad Air is not the most expensive tablet in this section. Recent competitive offerings from Samsung have forced the iPad Air to come down slightly in price, although you're still looking at quite a pretty penny for the iPad models with more internal storage. The latest Samsung Galaxy Note 10.1 2014 brings an incredibly sharp 2560 x 1600 pixel display, 3GB of RAM, and quad-core Snapdragon 800 to the table. Samsung's great pressure-sensitive S-Pen offers something other tablets simply can't match. The pleasant leather-like textured plastic back from the Note 3 has also made its way to its elder sibling and it works great visually. If you're big on typing, then Asus has you covered with its latest Transformer Pad TF701T. Basically a MeMo Pad on steroids, the TF701T comes with an ultra-crisp 2560 x 1600 pixel screen, a hefty quad-core 1.9 GHz Tegra 4 processor, and 32GB of expandable storage. We were a bit anxious about the lower battery times rating but our own review tests proved that the Xperia Z2 Tablet provides up to 80% longer web browsing and video playback times on a single charge than the original Xperia Tablet Z. 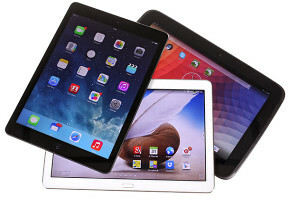 Still largely cost-prohibitive are the two largest members of Samsung's new Pro tablet family. There is the Samsung Galaxy Tab Pro 12.2 or the Samsung Galaxy Note Pro 12.2, if you are after Samsung's exclusive pressure-sensitive stylus functionality. Other than that, there is not that much difference between the two. They both have 12.2-inch screens with 2560 x 1600 pixel resolution, a minimum of 32GB of built-in storage plus a card slot, octa-core chipsets and 8MP cameras with 1080p video recording. Again, those come come with the latest Android OS v4.4 (KitKat) coupled with Samsung's home-baked goodies that bring a huge boost to productivy. The split-screen multi-tasking view is well overdue on high-res screen tablets and it's brilliantly implemented here, allowing to run up to four apps side by side plus even more in the form of floating windows.